Professor Bruno Olshausen is a Professor in the Helen Wills Neuroscience Institute, the School of Optometry, and has a below-the-line affiliated appointment in EECS. He holds B.S. and M.S. degrees in Electrical Engineering from Stanford University, and a Ph.D. in Computation and Neural Systems from the California Institute of Technology. He did his postdoctoral work in the Department of Psychology at Cornell University and at the Center for Biological and Computational Learning at the Massachusetts Institute of Technology. From 1996-2005 he was on the faculty in the Center for Neuroscience at UC Davis, and in 2005 he moved to UC Berkeley. He also directs the Redwood Center for Theoretical Neuroscience, a multidisciplinary research group focusing on building mathematical and computational models of brain function (see http://redwood.berkeley.edu). 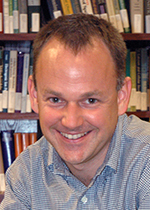 Olshausen's research focuses on understanding the information processing strategies employed by the visual system for tasks such as object recognition and scene analysis. Computer scientists have long sought to emulate the abilities of the visual system in digital computers, but achieving performance anywhere close to that exhibited by biological vision systems has proven elusive. Dr. Olshausen's approach is based on studying the response properties of neurons in the brain and attempting to construct mathematical models that can describe what neurons are doing in terms of a functional theory of vision. The aim of this work is not only to advance our understanding of the brain but also to devise new algorithms for image analysis and recognition based on how brains work.